Underneath my Youtube videos about icy roads, you'll see dozens of commenters talking about winter tires. "Why aren't people using them?" "That's what they get for using summer tires" "Winter tires would solve all of these problems". So what's the story? Are winter tires worth it? Are they the silver-bullet solution for preventing accidents during winter weather? To find out, in 2016, I purchased a set of winter tires (I paid for them personally) and used them during two seasons of my normal news coverage of icy roads across the country. I put them to the test on all types of road icing, from snow to sleet to freezing rain. In this article, we'll cover the results of these tests and separate the myths from the facts about winter tires. There are two main differences between winter and all-season tires. Winter tires use a softer rubber compound that is better at providing grip on snowy surfaces. The rubber in all-season tires, by contrast, tends to harden during cold weather and as a result, slide much more easily. The second main feature of a winter tire is the tread pattern (see image above). Winter tire treads have numerous narrow cuts in the tread called "siping" that give the tire an abundance of sharp edges that help "bite" into snow. Contrary to popular belief overseas, most people in the USA use all-season tires instead of summer tires. Snowy conditions are where winter tires shine. On slight inclines where all-seasons would spin fruitlessly, winter tires grab and keep the vehicle moving with few issues. I was able to start from a full stop on this hill near Pittsburgh, with very little wheel spin. The car is noticeably more stable when driving on snow, with much less wheel spin or antilock brake action. As I'll cover later though, winter tires will still slide if you are going too fast for the conditions or encounter a steep enough hill. Winter tires tackled this Pittsburgh hill with ease. Combined with the essential practice of slowing to a safe speed for the conditions, winter tires will dramatically increase your overall safety and stability on snow-covered roads. MYTH: Winter tires are just as effective on ice. I can assure you that winter tires will slide on ice with little provocation! I experienced just as much antilock brake action and general instability on the more slick types of road icing (such as freezing rain and untreated re-frozen snowmelt) as I do with all-seasons. Traveling too fast on the more slick types of road icing will get you into just as much trouble as you would with all-season tires. 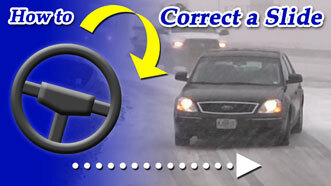 You've probably seen the "ice rink" tests where vehicle stopping distances are tested with winter vs all-season tires. The winter tires do have an edge in this department, but note that in those tests, the cars are traveling at relatively slow speeds on a flat, uniform surface. In the real world, there are hills, banked roads and generally higher speeds than what you can attain on an indoor ice rink. On ice, the only effective solution for a meaningful increase in stability are studded tires. Stud use is problematic for most people in the US, as the incidence of icy roads is too infrequent to keep them installed for lengths of time. Furthermore, studs are not legal in some states because they are damaging to roads . Studs also reduce dry-weather handling, as they cause less of the tire tread to be in contact with the road surface. MYTH: You can drive at normal speeds on icy roads with winter tires. I'll reiterate this: winter tires can and do still slide on slick roads. They may have a slightly higher margin of safety than all-seasons, but they still have a limit! If you exceed that margin, you will slide and lose control in the same manner as you would with all-season tires. The bottom line is that normal-speed travel on icy or snowy roads is not safe, even with winter tires. In this respect, winter tires are far from a silver-bullet solution for preventing accidents if the driver doesn't slow to a safe speed for the conditions. Like other vehicle safety features such as ESC, ABS and 4WD/AWD, winter tires have their limits. When the vehicle is driven beyond those limits due to overconfidence in the equipment, the end result is the same: an unstable vehicle state on the brink of a slide and loss of control. An overconfident driver with a safety-feature-rich vehicle will be at a greater risk of injury than the average driver as their accidents will tend to happen at higher speeds. In terms of the tires themselves, a set of good winters costs about the same as all-seasons. For my small Toyota Yaris, I paid around $450 for my set of a name-brand version. That's about what I've always paid for a new set of all-seasons. In using winters, you do have the up-front cost of a second set of tires. This initial cost, however, is offset in the long run: your normal tire wear is split across two sets, so your all-seasons will last longer (you're only using them 6-8 months of the year). The true cost of using winter tires comes with having to switch them out each season. If you use your stock wheels only, tire shops will charge for mounting and balancing each time you swap the two sets. This can be 50 to 100 dollars or more each time, and you'll be paying that twice a year. Some tire shops even have a policy to not mount used tires. To avoid the recurring mount & balance costs, it can be cost effective to purchase a second set of wheels for the winters to be permanently mounted - especially if you use them for more than two seasons. This is the recommended course of action, though it can be expensive: depending on the vehicle, this could be $500 to $1000 or more in addition to the cost of the tires. If you are a "function over form" type and don't mind a more basic look, plain steel wheels are the cheapest option. You will also need a second set of tire pressure (TMPS) sensors if your vehicle is so equipped. If the tires are already mounted on wheels, most tire shops will perform the seasonal swap free of charge if you purchased at least one set of the tires from them. You could even perform the swap of the wheel-mounted tires yourself at home. This is a common selling point you'll hear, but I saw no noticeable difference in handling in dry, cold weather between my winter and all-season tires. You don't buy winter tires for dry, cold weather - you get them for snow. If you never or rarely see snow-covered roads, there is little or no reason to use winter tires. FACT: Winter tires handle very poorly in warm or rainy weather. Since winter tires are made of softer rubber compounds, they are noticeably "squishy" during warm weather. This effect is really pronounced when temperatures rise above 50°F - it feels similar to the steering linkage being a little loose, especially at highway speeds. You can feel the car "wobble" during harder turns and cornering. The softer material means that winter tires will wear very fast in warm weather - you definitely don't want to leave them on very long once spring arrives. More importantly, winter tires can be dangerous on wet roads at highway speeds. Nearly all brands have very poor wet-road braking performance. This instability is very noticable and is downright scary! I experienced an incident during hard braking on an interstate at 60mph with only marginally-wet pavement (with temperatures near 50°F): I began to fishtail and my electronic stability control (ESC) system activated to keep the car straight. I don't feel safe going greater than 50mph on wet roads when I have my winter tires mounted. This means if you see as much rain during the winter months as you do snow and ice (as we do here in St. Louis, for example), this effect cancels out the safety benefits of winter tires altogether. Yes, it's true: winter tires are amazing on snow-covered roads. So why doesn't everyone use them? 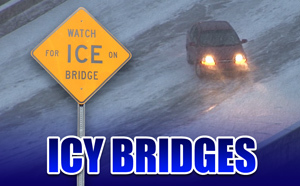 The main reason is that for most places in the United States, icy roads only happen a handful of times a year. Most of the US is not like Finland, Sweden or Russia where roads are snowpacked for much of the winter. Where I live in St. Louis, we see ice or snow on the road only 5 to 10 times each year, and that for only a few hours at a time. In much of the Southern US, snow or ice on the road only happens every 1 to 3 years. As you can see, there aren't many places that see snow and ice on the road more than 10 times each winter. Given the cost of using winter tires ($1000 and up for the tires and second set of rims), that's a hard sell for most people. Outside of the more snow and ice-prone areas shown on the above map, winter tire usage is rare among the driving public in this country. In the southern two-thirds of the United States, most tire shops don't even stock them (I bought my set during a trip to Columbus, Ohio - local shops in the St. Louis area do not keep them in stock). Furthermore, in regions with mild winters, the poor handling of winter tires outside of the few icy road events means that a vehicle's overall safety could actually decrease with winters installed. All of this means that for most people in the US, it doesn't make a lot of sense to go through the extra expense of winter tires when there are so few times that they'll be beneficial. You can greatly reduce your chances of an accident during the occasional icy road event by simply slowing down to a safe speed, even with all-season tires. And that's been the main message I've tried to convey on icyroadsafety.com: slow down for the conditions! I myself have spent 15 years covering winter storms and icy roads with all-season tires - even with a rear wheel drive pickup truck, and I can get around just fine on them as long as I don't push my luck with speed or on steep hills. Furthermore, winter tires don't make a vehicle immune to accidents on ice and snow. Winter tires will still slide, especially on the more slick types of road icing. 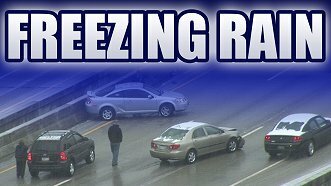 On freezing rain icing for example, I did not see a noticeable difference in braking performance. Should you buy winter tires? The answer primarily depends on where you live. If you're living in a more snow-prone location, particularly with hilly terrain, winter tires are a no-brainer. Outside of that rare demographic, you should be able to get by just fine without them as long as you reduce your speed when snow and ice are a threat. Even the tire manufacturers agree - they don't stock winter tires in most places, nor do they attempt to market them outside of the snowiest regions. Driving at a safe speed for the conditions for those few days out of the year that the roads are icy (or better yet, staying home or postponing your travel) is an adequate strategy for dealing with the occasional winter weather event. If you are driving too fast for the conditions, winter tires will only slightly decrease your chances of losing control.